Just when Suzy Maycomber is getting settled at the Academy in Hemlock, trouble strikes again. Suzy discovers one of her classmates murdered in the basement of the school, and the only witness is a ghost that speaks in riddles and rhymes. Determined to unmask the killer, Suzy enlists the help of Snowball and Alfie...but something doesn't feel right. The toil and trouble doubles when almost everyone in Hemlock begins acting differently, including Alfie. Can Suzy cast her way out of another case of murder, mystery, and mayhem, or will whatever is taking over the town get her, too? More, I want more of this series. 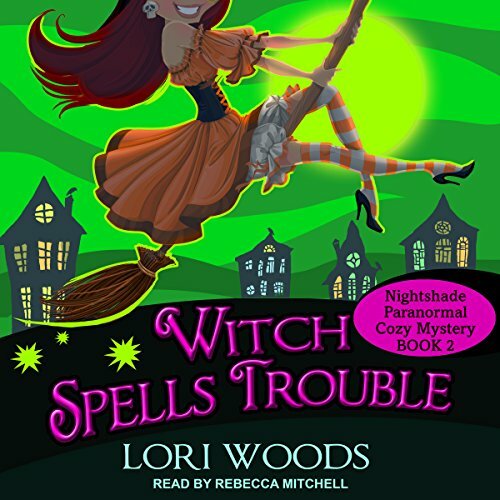 Lori Woods is one of the best new cozy mystery writers I have read/listen to this year. Her characters are warm and become more like friends than characters. I highly recommend this book and series to fans of paranormal cozy mysteries.